Material–Excellent HDPE & sturdy steel, durable to use. Surface–smooth, avoid scratching and wipe-clean. Quality–Water-proof, heavy-duty, not easy to fade color and aging. Folding Design–Convenient folds in half, with a handle, easy to storage, carry, space-saving. High Stability–with an interlocking midsection to strengthen central area and legs lock in place firmly. Style–Pastoral rattan weave design, create a picnic or leisure atmosphere. Our folding table has passed the test of EN581, safe and environmental to use. 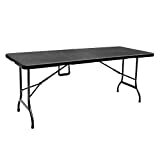 This portable folding table will bring you a large table space quickly since it can be fold or unfold within seconds. It is sturdy to use in picnic, camping, party, outdoor BBQ, dining etc. Light-weighted, convenient to carry & space-saving. Easy to clean with rag and soap. You will enjoy a happier leisure time with it. Our folding table is perfect to use for picnic, BBQ, garden parties, dining, festival celebrations, playing games, patio commercial shops like coffee shop, milk tea shop etc.